We’ve hurled robots at Mars for over 50 years — on one-way flybys and orbital trajectories in space, and onto the surface by parachute, airbag, rocket-crane, landing-feet and even wheels. In 2020, NASA will add another mode of Martian locomotion to the history books: rotor-blades. In a few short years the Mars Helicopter will fly the Martian skies to demonstrate how flying vehicles can expand a mission's range of exploration and gain access to terrain unreachable by ground travel. It was inevitable. With the technological explosion of small, remotely controlled drones popping up everywhere in our lives, it was only a matter of time before one started buzzing the skies of another planet. 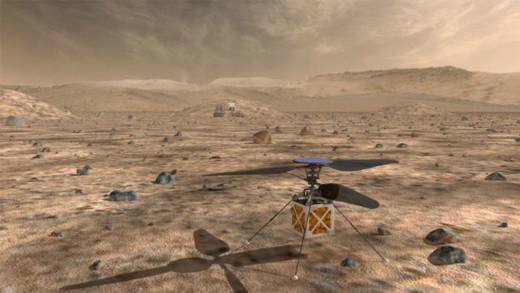 In development at the Jet Propulsion Laboratory since 2013, and after numerous rounds of testing, redesign and re-testing on Earth, the Mars Helicopter is ready to spin its light-weight propellers and test the air on the Red Planet. Mars Helicopter isn’t going alone. With a body only a few inches across and a total weight of about four pounds, this no-frills flying rotor-bot doesn’t carry the equipment or pack enough power for communicating with Earth. To be capable of propeller-driven flight in Mars’ thin atmosphere, it had to be designed as light as possible. This turns out to be an advantage in one way: it is small and light enough to hitch a ride on a larger cousin, NASA’s Mars 2020 rover, set to launch in July 2020. The tiny vehicle will be tucked away in the underbelly of the rover, and at an opportune time in the 2020 mission will be lowered to the ground. The rover— which is nearly identical in size and appearance to the Curiosity rover now exploring Gale Crater — will then back away to a safe distance and serve as a communication relay with Earth. How Will the Helicopter Fly? On Earth, the highest recorded helicopter flight reached an altitude of about 40,000 feet, where the thinning atmosphere requires faster and faster rotor speeds to maintain lift. Most conventional helicopters are not capable even of reaching the peaks of Earth’s highest mountains, like Everest. On Mars, the atmospheric pressure at ground level is equivalent to a 100,000-foot elevation on Earth. 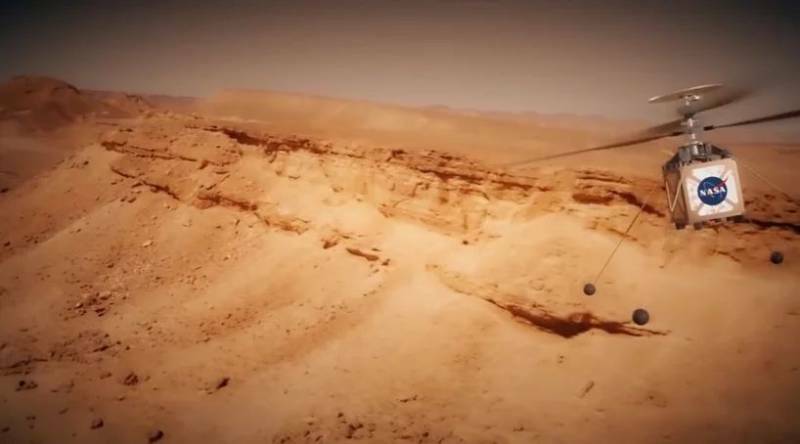 Obviously, Mars Helicopter isn’t your off-the-shelf drone. Its twin counter-spinning propeller blades will turn at 3,000 rotations per minute to lift the tiny craft off the ground, powered by a potent, lightweight lithium-ion battery that will be recharged by solar cells. NASA will test Mars Helicopter’s capabilities over a 30-day period, starting with simple, brief hops and gradually extending the flight distance and duration. The vehicle, once given its commands for a flight, will operate autonomously. The helicopter will spend nights on the ground, using battery-powered heaters to protect its equipment. Then, after the sun comes up the next day, it will recharge its batteries for its next aerial adventure. What will the Mars Helicopter tell us about Mars? The first of its kind, Mars Helicopter is more a test-of-concept project than a dedicated tool of scientific exploration. If the test exercises are successful, the tiny, self-controlled drone will demonstrate the capability for future missions to perform aerial surveillance and to visit places that are hard to get to by ground travel. If mission scientists have sighed at images sent back from Mars thinking, “I wish we could see what’s just over that ridge,” they may soon get their wish. While Mars Helicopter is hopping about the alien desert blazing a sky-trail for next-generation chopper-bots, the Mars 2020 rover “mothership” will be going about its own mission to search for evidence of past Martian life — regardless of the fate of its flighty companion. Despite the flashy allure of the first extraterrestrial helicopter tour, the real meat of the mission is in the hands of the car-sized rover. Mars 2020 will employ techniques for detecting residues of ancient microbial life that have been developed to study the earliest life on Earth — giving it the potential to make one of the greatest scientific discoveries of all time. That said, the test-flights of a semi-autonomous flying drone may pave the way to an entirely new paradigm of planetary exploration.